Rifle Paper Co. is a boutique stationery brand and design studio based in Winter Park, Florida. The creation of designer Anna Bond and her husband Nathan, this instantly recognisable range has dedicated fans around the world. The original illustrations have made Rifle Paper Co. famous amongst lovers of paper goods and design. 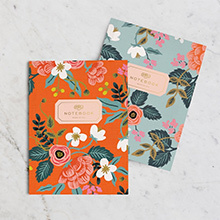 The endearing designs adorn the journals, notebooks & notepads. 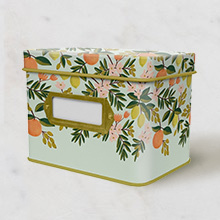 Get organised in the kitchen with a selection of handy items designed to make life just that little bit easier, with a flair of style to one of the most used rooms in your home. 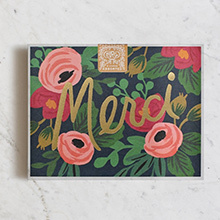 Send a thoughtful message and beautifully wrapped gift with a Rifle Paper Co. FSC-certified card and envelope that has a tactile beauty and a hand-drawn aesthetic. Spruce up bare surfaces with gorgeous, illustrated prints. These look even better mounted and framed and make a perfect unique gift. The range features Anna’s sublime and whimsical designs, which often include hand-painted illustrations and lettering to compose a style that feels both nostalgic and timeless. They specialise in stunning cards, notebooks, paper goods and art prints. Rifle Paper Co. takes great care in choosing all of their stock and printing methods to ensure their designs come to life in a way that’s elegant, durable, and beautiful. They strongly believe life’s personal stories and moments are best told through the gift of a hand-written card or note, and hope that our goods inspire you to share these moments with others. 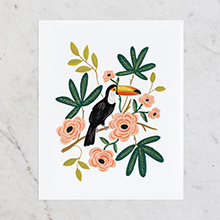 All Rifle Paper Co. notebooks, desk accessories, prints, cards and wrap are printed in the U.S.A using environmentally friendly papers and printing and then assembled by hand. Telegram Co. is the official, exclusive distributor for Rifle Paper Co. in Australia and New Zealand. Interested in stocking Rifle Paper Co.? Please complete our retail partnership enquiry form.